As I adjust to life here I've been getting acquainted with the local Baha'i community which is much larger than what I'm used to. One of my great joys over the last month or so has been helping to establish a Baha'i junior youth group. The participants are all about 11 years old and are full of energy and enthusiasm. Together we have started studying a book called Glimmerings of Hope as well as playing games, learning new prayers and planning a service project. The project they have chosen is to organize a food drive for the local food bank but they are all full of ideas for other service as well so I'm sure we will have much more on the go in the near future. Just before Halloween I walked into a second hand store called Rescued Treasures which had a sign in the window saying "Going Out of Business." My friends are in the middle of starting their own business so I decided to ask if they would be willing to sell some of their shelves. It turned out that they were but most of the shelves they were willing to sell were in their book section. The deal I ended up making involved me ending up with all the books that were left over at the end. I am now up to my eyeballs in books! A local farmer selling produce. One of the things I'm enjoying most about my new location is being walking distance from the local farmer's market. Of course this is not the first time I've lived near a market but this one is much bigger than I'm used to with more variety. 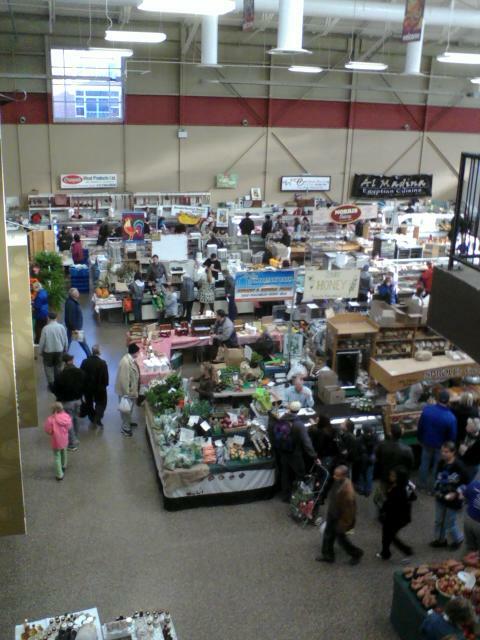 In addition to the expected selection of fresh produce they also have an amazing selection of meats, cheeses and baked goods. 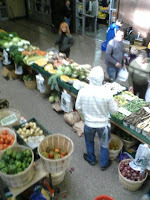 It's also an indoor market so as the weather cools down we can keep shopping without freezing. Here's a picture of my new home. I've just had a short trip back home to visit my family and was slightly surprised to notice the difference in weather. 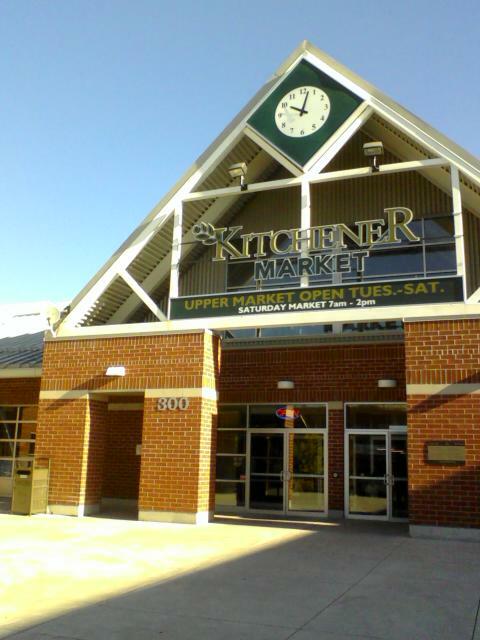 Kitchener is a bit south and further inland from home making it a few degrees warmer. Even though I knew this was the case I didn't really notice the difference until I went home and saw how much of the leaves have fallen from the trees. Here we are still covered in brilliant yellows, oranges and reds. Back home things are starting to look bare. Does this mean I won't be as cold this winter? But of course the leaves were not the reason for the trip. It was good to see everyone again and I have to say that it is nice not being on the other side of the world this time. As much as I love traveling it is nice to be able to visit home when you want to. When I left my house this morning I found the city getting warmed up for Oktoberfest. There have been signs of it for a few days - tents being set up, streets being blocked off - but today things really get started. I live right downtown so the festivities start only a block away. As a child I watched the Oktoberfest parade on TV for Thanksgiving and up till now that's about all I've known of the festival. Now that I'm here in person though I'm discovering there's much more to it. Beer and sausage are reported to be major components. A good chunk of King St. downtown has been closed off and a midway is being set up. Another chunk of King St. is closed further up the road in Waterloo as well. When I went to the market this morning I noticed signs for various activities being held today including a kiddie keg tap. I guess the get 'em started young here. 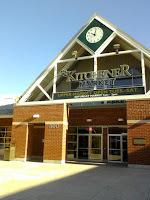 So my new city is Kitchener and I've been here a month now. I've lived in cities before but this is reminding me once again of some of the differences there are between living rurally or living in a town. I don't think people realize what a change it makes to have everything so close together. For people in the country they just get used to having to drive everywhere and the extra time and money are automatically factored in. For people who have only lived in the city they often don't realize just how much they have. It's interesting to note how stereotypes about each place have developed and how misguided they often are. For example, there is a notion that people in cities don't have a sense of community, that there are too many people to get to know and that people in the country and small towns are like one big family. But when you live in the country you don't see your neighbours. I don't mean you don't take the time to be buddies with them, I mean you physically don't see them. There's often at least an acre of land between your houses and since you need to drive to get anywhere you tend to go from your house to your car to wherever you're going in town without even a quick wave to say hi. Here, on the other hand, there are people milling about the neighbourhood and I could have three of them will say hello, ask me how I'm doing or comment on the weather before I get anywhere near my car. Another thing is stress. Many people tend to think that urban dwellers are bogged down by stress and that the country is the place to get away from it all. I say that's just silly. In the country not only do you have all the responsibilities and bills to pay that you would elsewhere but if your car breaks down you're screwed. Here if that happens I can take the bus. I also don't spend half my life trying to get to other places. That means I have more hours in my day. And forget the idea of rural people being fit from physical work. I am giving up my gym membership because I'm so much more active here. It has been requested that I start this up again. I was originally blogging to keep in touch with friends and family while on my year of service in Denmark and since then there hasn't really seemed like much of a point. I was home. People knew where I was and what I was doing. I didn't feel like my ego was big enough to keep broadcasting my life while doing what I normally do. However I have recently moved and, while I am still in Ontario, it is far enough away that the suggestion has been made to revive the blog. So for me it will feel somewhat like going about my normal life but this is a different part of the province and there are new things to discover. I'll do my best to share what I can and keep people back home up to speed.